This winter has brought a whole new meaning to cold in the Windy City and the need for warmer days with a cocktail in hand on a rooftop bar is at an all-time high. From developing signature craft cocktail menus to boasting some of the best views of the city, Chicago rooftops are a hot commodity and we have rounded up some of the best ones to visit for this upcoming season. Raised, located at 1 W. Wacker Drive, provides a stunning view of the skyline and Chicago River, with an outdoor area that features fresh flowers, fire pits, cabanas, couches and an outdoor bar with a decidedly urban feel. Under the direction of Executive Chef Russell Shearer and Restaurant Chef Tim Powles, the regular menu at Raised features American bar food with a twist, highlighting shareable plates – ideal for mixing and mingling with friends. Along with the beautiful outdoor patio, the warm and inviting interior makes Raised Bar the perfect place to enjoy stunning city views all year round. Chef Powles focuses on all things local, sourcing his menu ingredients within 200 miles of Raised. The beverage program at Raised is curated by Lauren Parton and the Raised Mixology Team and features an array of wines on tap, an extensive offering of local craft beers on draft and by the bottle, and specialty cocktails served by the glass or in a shareable decanter. The creative libations with seasonal, fresh ingredients encourage guests to sample and share. Raised was designed by The Gettys Group, fusing an industrial aesthetic with eclectic style and raw finishes. 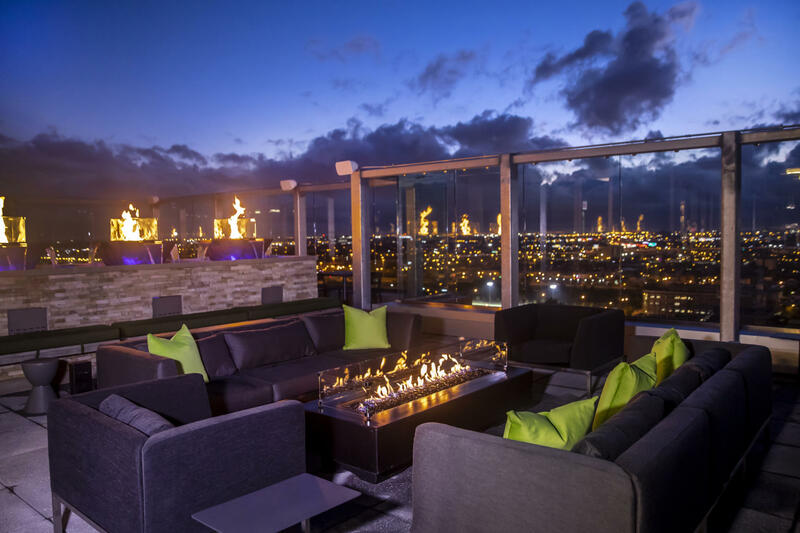 A glass wall lends to a stunning view of the skyline and Chicago River, while the outdoor area features fresh flowers, fire pits, cabanas, couches and an outdoor bar with a decidedly urban feel.